What Will You Learn About Hip Replacement Surgery? Here Is A Sneak Preview Of What You Can Learn. 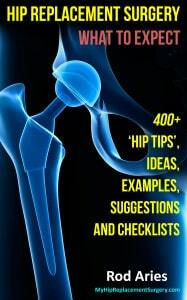 Hip Pointers – This chapter is an overview of what you will learn in the book. It includes links to hip replacement surgery videos and how to properly share the details of your upcoming surgery with friends and not-so-friends. Your Five Year Plan – When most people hear that a typical hip replacement surgery takes about 90 minutes, they think, “OK, that is easy. A short period of time, nothing to it.” In reality, the timeline is much, much longer. On one side of the surgery is the average one to four years you live with a bad hip before you have surgery and on the other side is the up to one year of recovery. I will share with you what to expect before, during and after your surgery. Animated: Take A Deep Breath, Then Watch An Animated Video Of A Total Hip Replacement – I can talk about the hip replacement surgery process to give you a perspective on what will happen during your surgery. But, in order to expedite your understanding of what actually happens to you, I have included an animated, three-minute video for you to watch for those who prefer the ‘cartoon version’ details. In case you love graphic punishment, you can view two hip replacement videos here. Here is the historical person, Vlad The Impaler, I use as a reference to describe the procedure. The Bonus – Their Facial Expression – That above sequence is much easier to recite AFTER you have had the surgery. 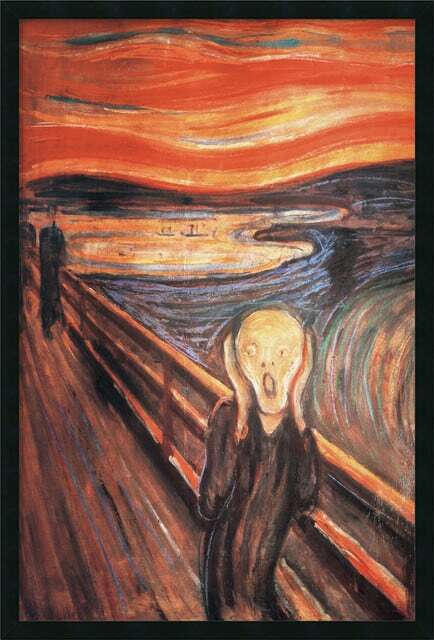 And, as a bonus, you get to see people’s faces look incredulous (imagine Edvard Munch’s The Scream painting) after you tell them what is involved. It is as if they have experienced some of your pain. While I can’t see your face to know if you understood the graphic details of the process, I might guess your eyes got a little wider if you didn’t. After your surgery, when your storytelling turn comes, watch the facial expressions of your friends and family – it makes all your pain go away. After you tell your friends the exactly how hip replacement surgery works, this is how they will look. How To Share Your Hip Replacement With Friends, And Even Those You Barely Know ( The ‘G’ Rated Version) – There are always some people that I just don’t know that well or they are just not ready for the graphic details of how a hip is replaced, so I share the ‘G’ rated version with them. I always believe in telling the truth so, when they ask, “Hey, what have you been up to?” Seizing the opening, I pause, take a deep sigh, then proceed to proudly demonstrate, like when I was in fourth grade when presented with my first 4H Blue Ribbon. I always show (even if they haven’t asked) someone my hip replacement surgery scar. Like A Model – Since I am usually wearing shorts, I slightly, and slowly, pull down on the waistband of my shorts, dropping it down just to the top of my femur (not to exceed the ‘R’ rating). I simply point to the top end of my scar and then I slowly run my finger to the other end, as if I were a model demonstrating a luxurious skin care product. As I reach the end of my nine-inch scar and see their eyes widen, I say, “Oh that? That is the scar from my second vasectomy. Now stand back and let me show you my hip replacement scar.” It is always good for a bit of sympathy, a rolling of the eyes, but, thankfully, it causes the person to go away. You Are Not Going To Like This Change In Your Life – If you are reading this book, it means that you probably have been suffering from hip pain. It also means that a change is coming and you probably will require hip replacement surgery. You Will Get The Full Score – It is hard to totally understand when you only have partial information. This book was written so you could understand what you might expect for your hip replacement surgery experience. This material is intended to be useful, helpful and to possibly allow you not to make some (many) of the errors I did during the course of my pain through recovery. I Hate To Give Away The End Of The Book, But, If You Do Nothing… Your Hip Will Get Worse – In the last year leading up to my hip replacement surgery, every month was noticeably worse than the previous month – but enough about my mother-in-law living with us, let’s talk about how my hip pain adventure may shed light on your hip pain. “Is My Hip Really Bad?” I list the most common symptoms indicating a hip that needs to be replaced. While there are variations for everyone, there are also common indicators, with the most common being hip pain. What To Buy And, As Importantly, What Not To Buy – I bought quite a few things (umm, more than quite a few) to combat my hip pain: OTC medications, tools and gadgets, assistive aids and even medical marijuana (dude). I will share my experiences with you as what worked, what didn’t and what I should have bought. Extreme Makeover Home Edition (Well, Not So Extreme) – I discuss every room in your home as well as tips and ideas of how to have everything ready when you return from the hospital. Snap, Crackle, Pop – Just what is involved in a total hip replacement surgery? It seems scary, but it is not as bad as it sounds. It’s The Destination, Not The Journey – For most adventures in life, it’s the journey. If you have a bad hip, it is the destination where you want to be, not the journey. Your Orthopod Is A ‘Sin Eater’ – Hmm, now why would I call the physician that is going to make your life better a sin eater? Thesin-eaterr concept stems from the Aztec goddess Tlazolteotl. At the end of someone’s life, they were allowed to confess their misdeeds, their regressions and their sorrows to her, and, according to legend, she would cleanse their soul by ‘eating their sins.’ Your physician will be your personal sin eater. All the bad habits you have, all the extra weight you have carried, all the extra stress you placed on your hips, all your bad genetics, in short, all your sins, will be eaten (and fixed) by your orthopod. Prehab, Rehab (And Ahab) – The prehab I did to shorten my rehab time. (You won’t be walking like Ahab anymore). The Tyranny Of Pain – Don’t let my biggest mistake be yours. I was under the total influence of pain and continually adapting to its’ rule. My biggest mistake? Not getting my hip replaced much, much, much earlier. Read on and see why. But Wait… There Is More! – Throughout this web site, I have provided information and hyperlinks across many, many pages. For many, it is simply easier to buy the Kindle version of the book and read it without having to site at your computer. Alrighty… that concludes Chapter 1.